Picture a bread knife bent into a half-diamond shape, with all the serrated points facing outward, and you will have a good mental image of a single iguana tooth. The drawings below are missing that fine detail. The photo by Adam Britton of Kim Scott's Brownie, however, do help show some of the, er, finer points, of iguana teeth in situ. Iguanas are pleurodonts - their teeth grow attached to the side of the inside of the jawbone (see the bottom drawing - it is the tongue's-eye view of the inside of the lower jawbone with the flesh cut away). Iguanas regularly shed and grow new teeth (no, not just the ones they leave buried in your foot, hand,or arm when they bite you!). Iguanas are born with teeth - that's how they are able to easily harvest leaves. As the iguana gets bigger, the almost transparent teeth also get bigger and are so more easily seen when the iguana opens its mouth. Drawing from: Laboratory Anatomy of the Iguana, by Jonathan C. Oldham and Hobart M. Smith. 1975. Wm. C. Brown Company Publishers, Dubuque, IA. Close-up of teeth. Teeth by Brownie, photograph by Adam Britton. Used by permission. Kim Scott is kept by Brownie. Do click on the photo to see the enlarged version wherein the serrations on the teeth are clearly visible. 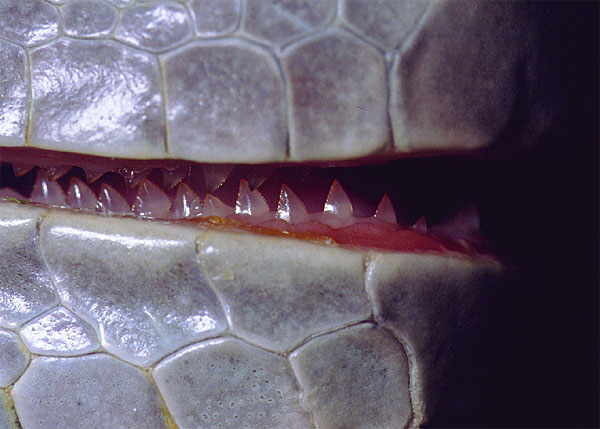 Reptiles teeth grow in three different ways. In thecodonts, the teeth attach to the bone (as in crocodilians). In pleurodonts, the teeth arise from a one-sided groove (as in many reptiles, including iguanas). Other lizards are acrodonts, in whom the teeth attach directly to the bone surface. Teeth are replaced continuously throughout the pleurodont and thecodont reptile's live. In acrodonts, however, it happens only in juveniles. Chelonians don't have teeth - instead, their jaws are covered with a keratinous "sheath" called a beak.